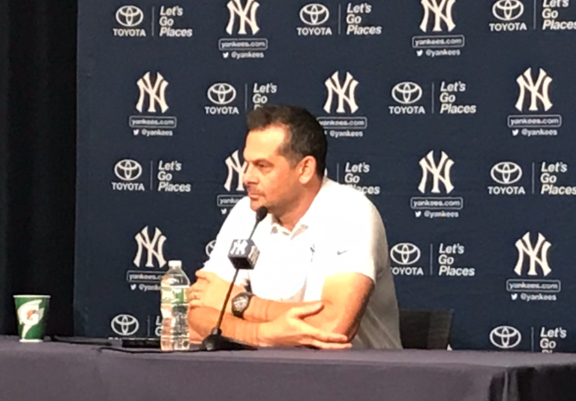 Brooklyn Digest: Boone: Yankees need to "get better on the margins in every aspect of the game"
Boone: Yankees need to "get better on the margins in every aspect of the game"
Aaron Boone on Friday at Yankee Stadium. Photo by Jason Schott. Yankees Manager Aaron Boone had a successful season in his first year at the helm, navigating his team to 100 wins in the regular season as they dealt with injuries to slugger Aaron Judge and the pitching staff. In the playoffs, they beat the Oakland A's in the Wild Card Game, but they lost in four games to the Boston Red Sox in the ALDS. 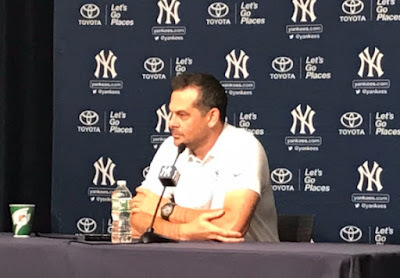 Boone had his farewell press conference for the season on Friday afternoon at Yankee Stadium, and said of how it has been since the season ended on Tuesday night, "The last couple of days have been tough. Any time you pour as much, and as many people pour as much into the season, and you get to the postseason and you get that opportunity, and then all of a sudden, it's finished. It's difficult, you kind of go numb, you know, you play back every scenario, think about where you could have done some things different. You think about some of the great things that different guys did and you reflect a lot on the season, but you know, it's difficult when you have a great opportunity in front of you and you feel like you have the people to get it done and it comes to an end like it did." On how he can improve going into his second season as Yankees Manager and if he'll do anything differently, Boone said, "I think, obviously having never done this, coming into the organization when I did last year, kind of learning about the organization, about our players, getting to know guys, all these things that you do, on the fly and kind of rapid fire, I feel like going into this offseason, knowing my players as well as I do now, knowing my staff, knowing the front office, hopefully that puts me in a better position to hit the ground running in the offseason. "I think it's about continuing to improve. I talk about our players and continuing to improve our game on the margins in every facet. The same holds true for me. Are there some things that I want to change a little bit? How we get information to the players, how we shape our game plans, how my communication happens with my coaches and my players. Those are all things that, frankly, start now and, hopefully, the offseason provides a time when I can refine those things, sharpen those things, get even better at those things because they're so important. "Living here now year-round, I'll be in here, have a chance to be in the office and collaborating with our scouts and Cash (General Manager Brian Cashman) and our analysts, so I can't wait to continue it, kind of, in earnest, because I know what a good position we are in as a ciub and the opportunity that is still in front of us." Boone said of his message to Yankees fans on why their season is over now and how next year will be different, "First of all, our fans are unbelievable, and I know many of them are heartbroken like a lot of us are because I think we understand the potential of this club. To see them lose the last two games when we were behind, the way they continued to be a factor, and I feel like in a lot of ways, our ninth inning rally there (in Game 4), you know, was in large part due to them, almost willing it, they just weren't going to die. "My message, as my message was to our players, is I think we all understand that we're capable of big things, and I think that we are on the short list of teams that legitimately can think we can win a World Championship, but we've got to get better, and that starts with me. It starts with all our guys, going into the winter, understanding that a lot of guys did a lot of amazing things, a lot of successful things, but we've got to continue to be obsessed with being a little bit better in every aspect. "From my standpoint, that kind of starts now, like diving in, being a part of, you know, what we do in the winter as far as being here, collaborating, talking baseball, how can we be better, how can my process be better, how can my communication with coaches, and just getting information to players and, ultimately, our biggest job is putting, trying to get our players in the best position to be successful, and that's an ongoing process, ongoing trying to develop that, but ultimately it's continuing to get better on the margins in every aspect of the game. That's our expectations, we're not far off at all, and I would say I can't wait, but I feel like we're in the midst of living like I can't wait to continue to chase this thing." On how he feels he did taking over a team with World Series expectations, Boone said, "I'll leave that to you guys (referring to the media). I don't even want to go there and reflect. I'm constantly evaluating our team, you know, how we go about things, the decisions we make, our process. I reflect on those kinds of things, try to evaluate the best as can, but as far as then evaluating how I did, I'll leave that to you guys, honestly." After getting rave reviews throughout the season for how he handled his team, Boone face some growing pains in the playoffs, including when he came under criticism for leaving starting pitchers Luis Severino and CC Sabathia in too long in the third and fourth games of the ALDS. Severino struggled through the first three innings of the game, allowing three runs, but Boone brought him back out for the fourth. Severino proceeded to load the bases with nobody out before he was lifted, and it was the start of a 7-run inning for the Sox as they rolled to a 16-1 win, giving them a 2-1 lead in the series. Boone said of his decision-making with Severino, "Looking back at the Game 3 with Sevy, where Sevy - I didn't feel like was on top of his game, and I think that's the one I look back where I say, alright, I probably got greedy with Sevy in the fourth there, wanting to get him through the bottom of the order, and he came out and really struggled, obviously, and then it kind of snowballed...After the third inning is the one I look back on that I should have had him out of there because I sensed that he wasn't on top of his game. I felt like they were having a lot of good swings against him, and I probably got a little greedy thinking he could get through the bottom of the order there in the fourth." The next night, in Game 4, Boone faced the same dilemma with CC Sabathia in the third inning, and once again, he left his starter in too long. The inning began with a hit-by-pitch of Andrew Benintendi, then a soft single by Steve Pearce, and a sacrifice fly by J.D. Martinez to make it 1-0 Boston. After he got Xander Bogaerts to ground back to him for the first out of the inning,, Sabathia gave up a two-run double to Ian Kinsler, followed by an Eduardo Nunez RBI single to make it 3-0 Boston. Sabathia got Jackie Bradley, Jr., to ground out to first to end the top of the third. The Red Sox tacked on a run in the fourth, on a Christian Vazquez home run against Yankee reliever Zach Britton. That made it 4-0 Boston, and that was all they needed as they held on for 4-3 win to clinch the series. Boone said of any thoughts he had about going to the bullpen in the third and why he stuck with Sabathia, "We had them moving around the previous inning, getting prepared so there was some thought after the Benintendi hit batter, like maybe that's the spot. I also felt like, and with CC, there's times throughout the year where we're a little more aggressive in getting him out of there because we feel like you can recognize his stuff falling off. I felt like stuff-wise, he was okay, and going into that game, obviously, we had Robby (David Robertson), (Zach) Britton, (Dillon) Betances, and Chappy (Aroldis Chapman) well-rested and knew we could get length out of them. "I think where the decision, for me, came down to balancing six or seven potential innings out of those four guys. You know, when is the right time to make that happen? In my mind, it wasn't a clear decision to say CC can't get through this or CC - and I thought there was great value if CC does get through the third, knowing we have those four guys in a six-inning scenario. So, if there was any bump in the road with those four guys along the way, in a six-inning scenario, I thought we could absorb it. Beyond that, I thought we were playing a little bit with fire. CC ends up getting JD (Martinez) and Bogaerts out, and then Kinsler smokes a ball off him, and at that point, after the Kinsler one, I just felt like we need to get him through Bradley, you know, he jams Nunez for the next hit. "I mean, those are the decisions, especially in the postseason, that, I understand, come under the microscope, are very, you know, it's a little bit gray. It's easy in that spot to just kind of, I'm gonna run and go get Robby in this spot, but then maybe we're leaving ourselves a little bit short going forward with a guy that I didn't think was overly off his game in CC, and as it turns out, you know, after the lead-off homer that Britton gives up (in the fourth), you know, they (Yankees bullpen) go on to shut them out for six innings, and I feel like we weren't up against it with any of them as far as overextending them...You also understand that those are the close decisions, and in a way, cost us, because that was the inning ultimately that we weren't able to overcome." Boone said of the reality of the job meet the perceptions he had when he became manager of the Yankees, "I would say, how do you really know, I would say whatever, I would say to some degree yes, but I would also say you never really know until you've sat in the chair and, you know, all the little big things that come across that desk on a given day. "It's been, overall, amazing. I've loved every second of it. It's tough, it's fun, it's rewarding, it's gut-wrenching, it's painful when it comes to an abrupt end, but I wouldn't want to be doing anything else right now, especially with our guys and what I know we're capable of, and knowing that we're one of those teams that legitimately walks in with a chance to gain the ultimate prize, which is another world championship. To have that opportunity with this group, I don't take lightly."